Fish should be integrated into your dog’s diet since it’s healthy and rich in fatty acids. But if you don’t have the time to look for the best salmon dog food on your own, we can help you out. 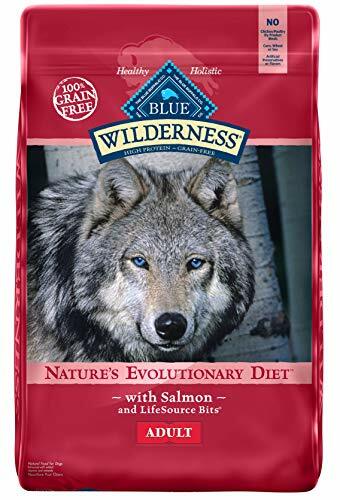 After consulting various reviews on the market and the opinion of specialists, Dr. Fox concluded that a product worth mentioning is the Blue Buffalo Wilderness High. It is made with deboned salmon as well as chicken and fish meal to provide the necessary amount of proteins, and it also contains wholesome fruits and vegetables for a healthy intake of vitamins and minerals. The food doesn’t feature any poultry by-products, soy, wheat or corn. If this product is not available right away, perhaps Crave Grain Free would be a suitable alternative. If you want to make sure that your adult dog gets a healthy helping of Omega-3 and Omega-6 fatty acids, then you should consider the Blue Buffalo alternative. Thanks to the fish content, this product is capable of maintaining your dog’s healthy skin and coat and can even make a difference when it comes to boosting your pooch’s immune system. Naturally, the fish content also helps with supporting eyesight. Not a good choice for dogs that need low-protein diets. 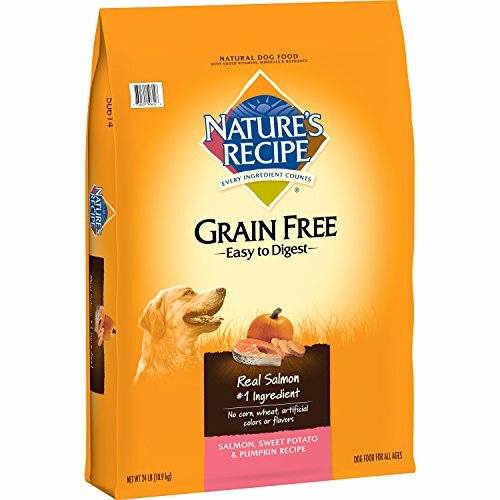 The ingredients in this formula are safe and contain no corn or animal by-products, and they also do not come with any flavors or artificial colors. 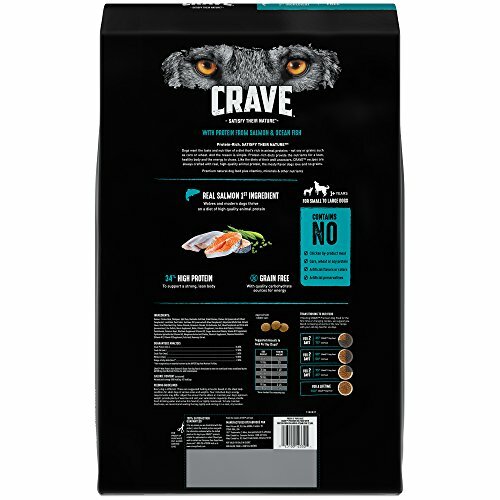 Available in three package sizes that range from 4 pounds to 22 pounds, the Crave alternative is made with real protein coming from salmon. The ingredients will help your Fido benefit from a diet rich in minerals, vitamins, natural antioxidants, as well as a good healthy dose of Omega 3 and Omega 6 fatty acids. Because it does not contain any potentially dangerous ingredients, it’s completely safe. It’s high in protein and might give dogs a lot of gas. If you need a dog food that can assist your pooch in overcoming allergies, hot spots, or pretty much any type of dermatological issues, this is the right one. 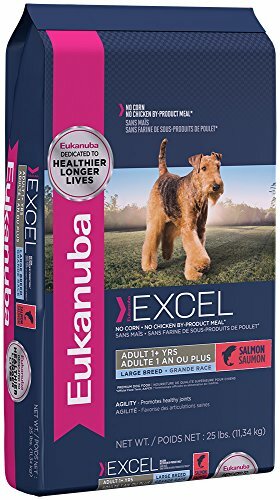 If you have a large breed, you should give a shot to the Eukanuba Excel formula as it is made from healthy salmon and it has plenty of high-quality protein. The food will assist your pooch in becoming strong and equipped with a healthy coat and a crystal clear eyesight. Thanks to the Omega 3 and Omega 6 content in this food, your dog’s cognitive function and brain will be supported. The pellets can remove tartar, too. Some buyers describe this as a little pricey. This product is a great option for dog parents who own large breeds. It can help reduce the amount of tartar on your dog’s teeth and it comes with plenty of Omega 3 and 6. There is a great variety of dog foods on the market, so how can you be sure you chose the right one for your pet? We decided to lend you a hand and picked some of the items we consider to be suitable. Showcased below you’ll find everything you need to know about them. This food is available in plenty of delicious flavors and was specifically designed to meet the needs of various dog age groups and breeds. Therefore, you can choose between chicken, duck, salmon or others. The package is also sold in three sizes, ranging from 4.5 pounds to 24 pounds. The food is made with real meat as the number one ingredient and also contains fish meal to ensure optimum level of proteins for your dog. Enriched with natural vitamins and minerals, the food from Blue Buffalo is perfect for adult dogs. Thanks to the food’s high content of Omega-3 and Omega-6 fatty acids, your pet will benefit from a shiny coat, a healthy skin, an improved immune system, and strong vision. We liked that the ingredients are safe to reduce the risk of food poisoning, allergies or digestive problems. Therefore, you won’t find any corn, poultry by-products, soy, wheat, artificial flavors or colors. 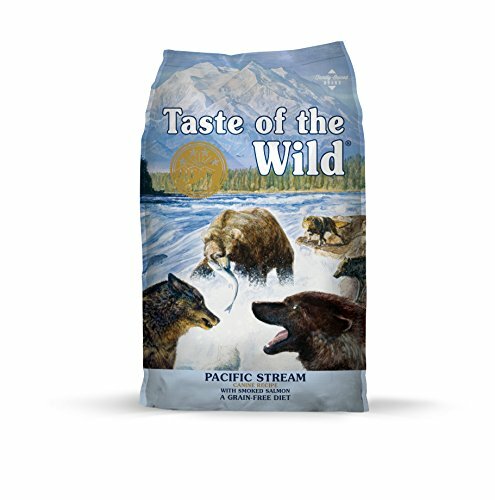 The food is designed for all breeds of adult dogs and provides a complete nutrition. It comes with high-quality proteins from salmon and ocean fish, as well as Omega-3 and Omega-6 fatty acids that support a healthy and active lifestyle for your dog. These elements are perfect for strong muscles, bones, a good vision, and a shiny coat. This organic product is delivered in three package sizes, ranging from 4 pounds to 22 pounds. Each bag of food is made of top-quality ingredients that will provide a balanced and nutritious diet for your adult dog. 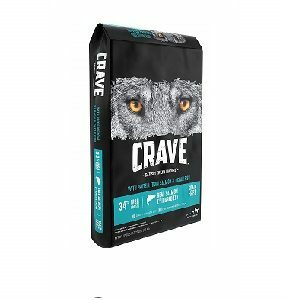 Made with salmon as the number one ingredient, the Crave Grain Free contains no less than 34% proteins, while the rest is represented by a mix of vitamins, minerals, natural antioxidants, and carbs for more energy. The food can be safely fed to all dogs as it doesn’t contain any chicken by-product meals, corn, soy, wheat, artificial flavors, colors or preservatives. This formula was specifically created for large dog breeds. It is made with 100% natural and healthy salmon and high-quality proteins to ensure a complete and balanced nutrition for your adult dog. The food will help your dog build strong muscles and bones, improve vision, and support a shiny and healthy coat. The product contains the optimum amount of proteins, fats, carbohydrates, vitamins, and minerals to ensure a healthy weight. 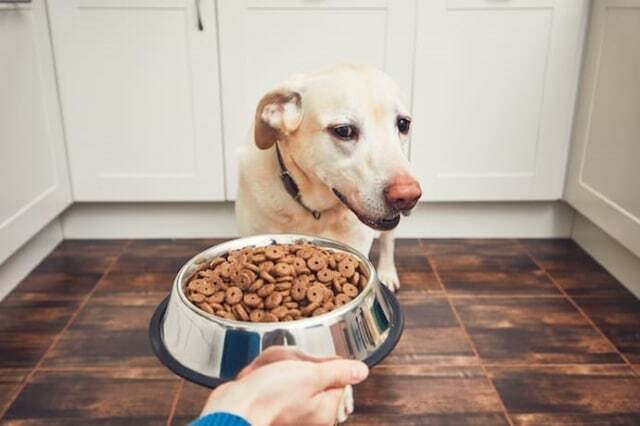 There are no empty calories in this food so you can rest assured your dog will not get overweight or obese, as long as you’re following the feeding instructions. 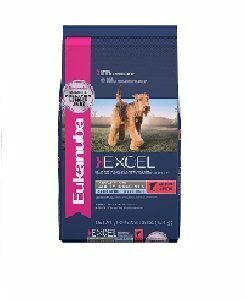 The Eukanuba Excel is made with salmon as the number one ingredient which is packed with Omega-3 and Omega-6 fatty acids to help support healthy joints and strong bones. Moreover, thanks to the 3D Dentadefense System, this product will reduce tartar and will promote good oral hygiene so that you won’t need additional dental sticks for dogs. If you’re looking for a good salmon dog food with a delicious recipe, this product should be on your shopping list. The recipe contains salmon, sweet potatoes, and pumpkin, providing the ideal balance between proteins, vitamins, minerals, and carbs. High-quality real salmon is the number one ingredient in this food, and, thanks to the high content of Omega-3 and Omega-6 fatty acids, it will promote a powerful immune system, and will maintain your dog’s bones and muscles strong. Both the sweet potatoes and the pumpkin represent grain-free sources of carbohydrates that will give your dog enough energy to keep on going for the entire day. This way, your pet will burn more calories and will live a more active life. 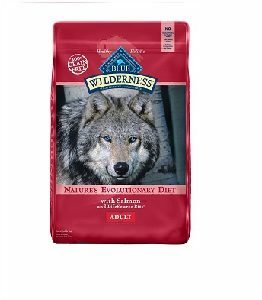 What we liked about this item is that it is formulated for pooches of all breeds and ages, so it can successfully replace even some high-quality senior dog food or puppy food products. It doesn’t contain wheat, corn, soy, artificial colors or flavors. The food is sold in various delicious recipes to meet the requirements and tastes of dogs of all breeds and ages. Apart from the Pacific Stream Salmon, you can also opt for food made with venison and bison, lamb or roasted duck. The product is available in packages ranging from 4 pounds to 30 pounds, so make sure you opt for the best one for your dog’s needs. Smoked salmon is the number one ingredient in this food, providing a valuable source of proteins and fatty acids. These will promote a healthy immune system, strong bones, and strong muscles for your dog. Besides, the Omega-3 and Omega-6 fatty acids will take care of your pet’s coat, making it shiny, healthy, and thick. The food is also packed with delicious fruits and veggies that provide the right amount of vitamins, minerals, and natural antioxidants that will keep your dog healthy, strong, and active. Enriched with probiotics, the product is easily digestible and won’t cause allergies, food poisoning or digestive problems. If you’re looking for cheap salmon dog food available for sale, you would be surprised to find out there are plenty of options available on the market. However, in order to make sure you found the perfect one for your dog’s needs, here are some aspects you need to take into account. We cannot talk about the right type of dog food without mentioning at least some of its ingredients. You should always try to purchase high-quality products with real meat as the number one ingredient. Chicken meat, duck or turkey represent the primary sources of proteins necessary for the healthy growth of your dog. However, salmon is essential if you want your pet to have strong teeth, bones, muscles, and a sharp vision. 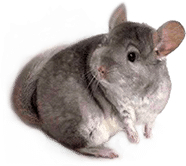 It is high in Omega-3 and Omega-6 fatty acids that will also have a positive effect on the skin and coat of your animal. Therefore, we strongly suggest you choose organic dog food with quality protein to make sure your pawed friend receives all the necessary nutrients. Proteins are important for your dog’s growth, but they should be combined with a healthy source of vitamins, minerals, antioxidants, and amino acids. Carbs are also essential because they are in charge of boosting your dog’s energy levels and help it enjoy an active lifestyle. We would suggest opting for foods that contain potatoes or rice as their main sources of carbs. You should stay away from low-quality carb sources that only offer empty calories such as corn or wheat. Consumed in excess, these ingredients will easily lead to overweight and obesity problems. If you still have doubts about the best food for your furry friend, you might as well go through some online salmon dog food reviews and read the opinion of other customers. Organic coconut oil for dogs is a great alternative for when you want to look after your pet’s diet. It is rich in vitamins A and E, promoting a shiny coat and fighting against skin problems. Its sweet flavor can be easily integrated into dog treats for training or cookies but you can also serve coconut oil on its own. If you care about your dog’s health, you might want to stay away from foods with too many ingredients. Most of these products contain significant amounts of wheat, corn, soy, and meat by-products that only mean empty calories without any nutritional value. Thus, they will make your dog puffier and make it gain weight in the long term. Artificial flavors, colors or preservatives should also be left aside from your dog’s diet as they could lead to skin rashes, food poisoning or more complicated health problems. Luckily, there are numerous brands that not only offer delicious meals for your dog but they also pack their foods with the right organic ingredients. But, no matter what type of food you decide to buy, make sure you always read the ingredient list and stay away from poultry by-products or shady substances. If the salmon dog food seems out of your league, for now, you might want to supplement your pet’s diet with fish oils.